You wrote your scraper on a whim. Because it’s a wiki, some other people found it, and helped fix bugs in it and extend it. And now your whole business depends on it. 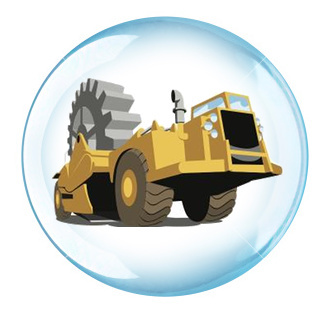 For when that happens, we’ve just pushed an update that lets you protect scrapers. This stops new people editing them. It’s for when your scraper is being used in a vital application, or if you’re storing data that you can never get back again just by rescraping it. 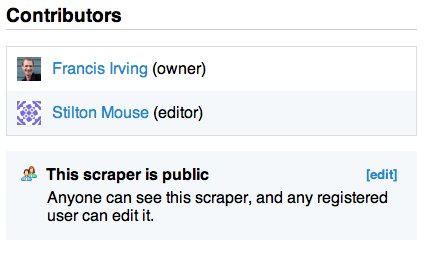 To protect one of your scrapers, or indeed views, scroll down on the overview page to the Contributors section. It says “This scraper is public” – the default, ultra liberal policy. So radical that Zarino, ScraperWiki’s designer, suggested that the icon next to that should be a picture of Richard Stallman. We went for a dinky group of people instead. If you’re the owner, pick edit to change the security of the scraper. Then choose “Protected”. You can then use the “Add a new editor” button to let someone new work on the scraper, or “demote” to stop someone working on it. Protecting scrapers is completely free. Later in the summer we’ll be introducing premium accounts so you can have private scrapers. I know this is a dangerous path to go down but…. any chance of some kind of communication feature so people can request to be editors/send patches? Yes! There’s a few other things on our plan before that though… Please give us feedback when you feel a need for that kind of facility, and in what way. To be clear, there’s no point us recreating github here – we want to do things in a particular way that help with data projects, and with web-based code editing.